TGIFF! Wishing everyone a great Friday - complete with a flamingo! So beautiful! 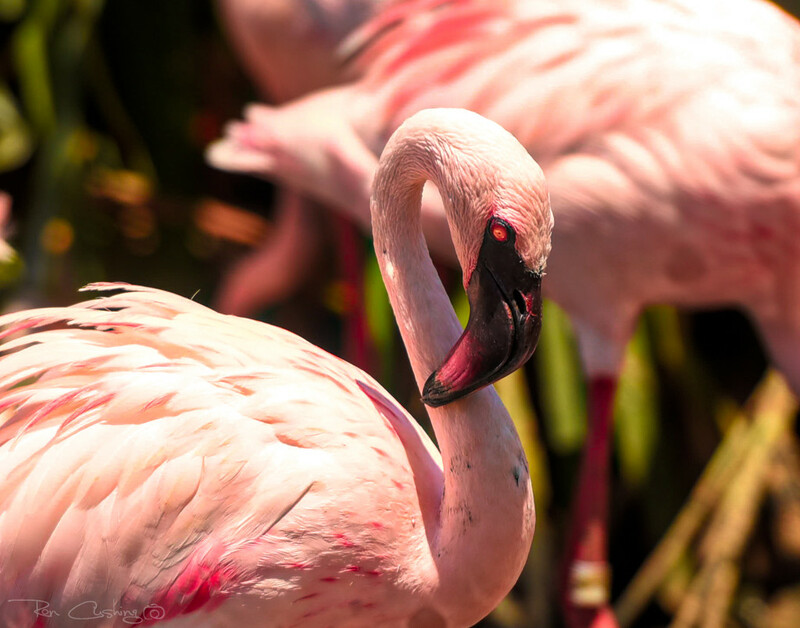 I always love your flamingo photos (where do you take them??) I posted my first flamingo shot today in your honor. Granted mine is kind of pathetic but funny. This chap looks quite sinister with his red eye. I just love these birds and love it when they pop up on a Friday! Beautiful colours! Great capture! He/She actually makes me think of the baby blanket I just started for my expected great grand-daughter - white with pink flecks. Maybe I should get her a flamingo to go with it! Lovely bird! Such pretty colors. Another fine flamingo foto. Love how the frame is nearly filled with flamingo-pink. Yes, macro March in alphabetical order. For &quot;X&quot; I've done X-acto knife, xylophone, and x-ray in the past, but THIS year, I'm not certain just what unique thing I'll find. @redy4et I love your flamingo shot! I actually have some of those in my back yard...and my gardener hates them! As for where I get the shots, generally the SD Zoo and Wild Animal Park. If you're still in the Palm Springs area, stop by at the J W Marriott. Several flamingos are hanging around there - and even a couple of black swans! @yorkshirekiwi This particular line of flamingos, the Lesser Flamingo, often has a distinctive reddish eye. It results from the same kind of food that gives them their pink coloring. I'm guessing that the zoo pumps up their beta carotene content. @onewing He does have kind of a nasty look, now that you mention it. See above for the red eye cause. @pamknowler Thanks Pam - just one more reason to love Fridays! @kklinck Thank you kindly Miss Kate. @gilbertwood Thanks Denise - love your crazy made up phrases! @shannejw Thanks Shanne. As I mentioned to Carole above, I suspect that the zoo adds a little extra beta carotene to their diet to bring that pink out. @stownsend Thank kindly, Suzie. That's one lucky little girl! I'm sure a pet flamingo would be perfect for her! @mwhipple Muchly appreciated - if only it was a penguin! @bkbinthecity Thank you very much Brian. @pcoulson Thanks Peter.....flamingo whisperer? More like agitator. They seem to squawk like hell and get all bent out of shape when I show up with my camera. Maybe it's the alligator on my shirt? @lyndemc Thanks Denise - if only they were brown, huh? ;-) Good luck on the X! @stownsend I saw some darling Beany Baby flamingoes recently! 😊 @stray_shooter This fellow is so cool. Beta Carotene in the diet, eh?! I think I’ll buy some for my hydrangeas, it should pink them right up! @louannwarren Thank you for the idea!